Obituary for James Nelson Fay | McCombs Funeral Home Inc.
James Nelson Fay, 93, of Farmington, Missouri, passed away April 16, 2019. He was born June 21, 1925, in St. Louis, to Roy and Lillian Nelson Fay. He and Marjorie Eloise Enzinger were married February 21, 1948. They had been married nearly 63 years when Marjorie passed away October 15, 2010. James was a 1943 graduate of Beaumont High School and a 1950 graduate of Washington University. He was an honorably discharged veteran of the U.S. Army. 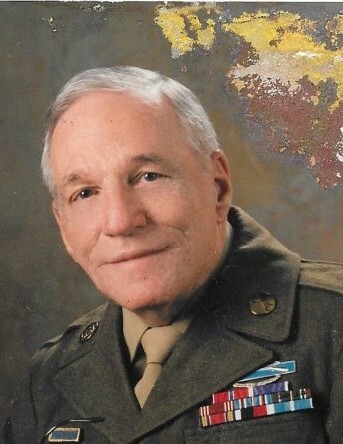 He served with the First Infantry Division during WWII from Omaha Beach to Aachen, Germany. He was awarded the Bronze Star, Purple Heart, Combat Infantry Badge and three battle stars. He was an instructor at the Engineer School, Fort Belvoir, VA during the Korean War. James loved classical music and played the violin. He was a member of the St. Louis Philharmonic Orchestra and 17-year member of the Alton, Illinois Civic Orchestra He was an aeronautical engineer with McDonnell-Douglas and the U.S. Army Aviation Systems Command, retiring in 1987. Loving survivors include two children, Bruce R (Linda) Fay and Patricia A Fay; three grandchildren, Brendan A (Shawna Lee) Fay, Meghan E (Chris Bortz) Fay, and Amanda M (Ryan) Aubuchon; five great–grandchildren, Madeline and Sadie Fay, Kaden, Lillian and Logan Aubuchon; and a step-great-granddaughter Katie Bortz. He was preceded in death by his wife, Marjorie; his parents; and a brother, Robert (Helen) Fay. There are no formal services, but James will privately be laid to rest with Marjorie, at Memorial Park Cemetery on Lucas Hunt Road in St. Louis. Cremation accorded by McCombs Funeral Home and Cremation Center in Jackson.